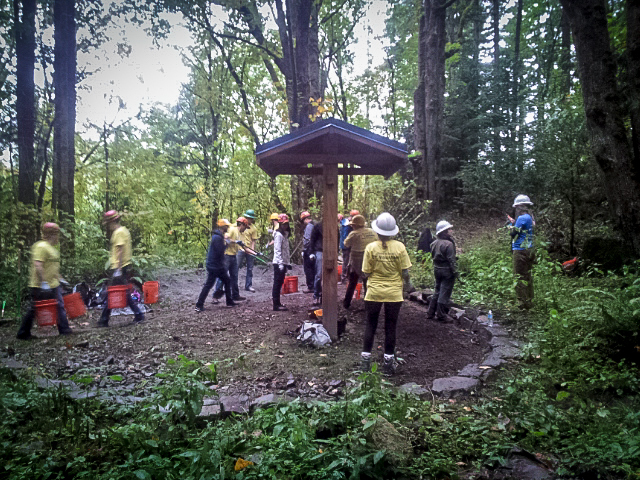 On Friday, King County Parks worked with Mountains to Sound Greenway staff as well as forty volunteers from Ernst and Young on some major updates on the Grand Ridge Coal Mine Interpretive Loop. The loop trail, including the area around the back country kiosk (pictured) was graveled, a rock curb delineating the kiosk area is now complete and significant drainage work was done on a portion of the Grand Ridge Trail. Thanks to everyone who helped! If your interested in upcoming volunteer events click here.